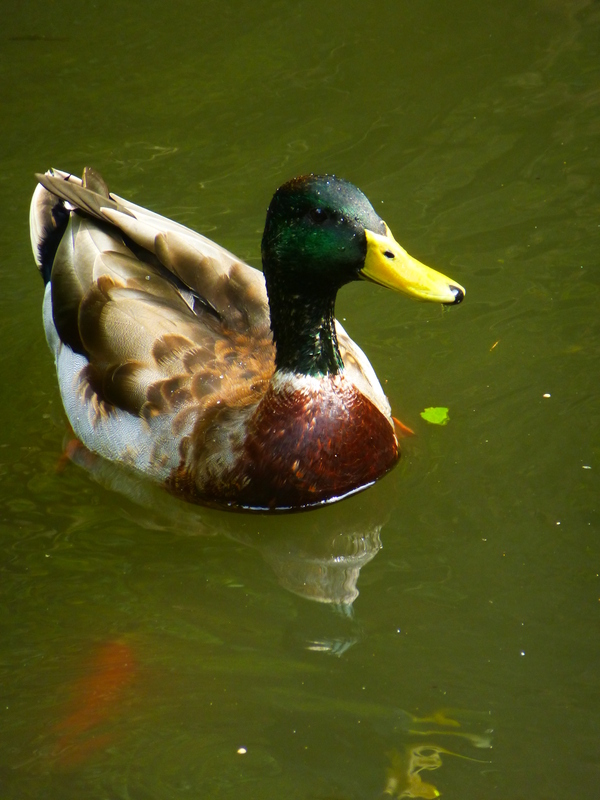 I’m tendering another duck report in lieu of readers’ wildlife photos, but be sure to send yours in—the tank is lowering. 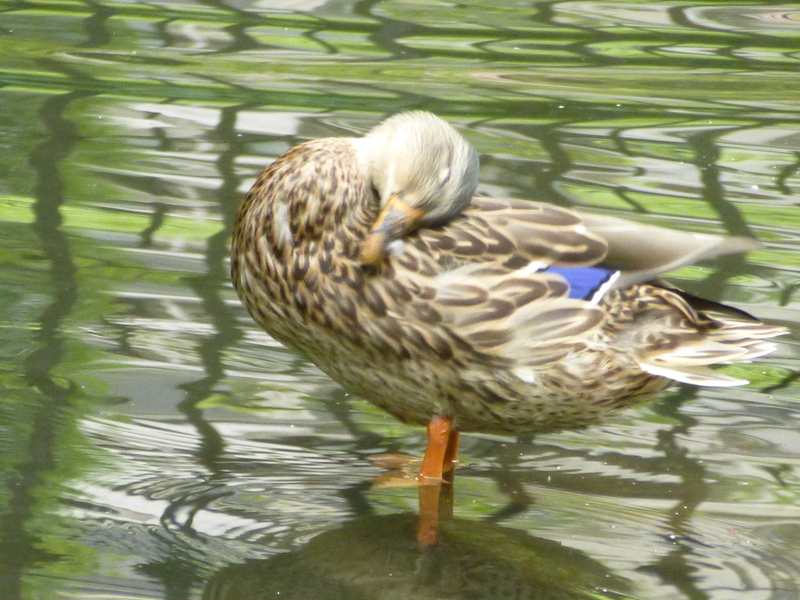 As of yesterday evening, Honey and James Pond (who has a license to bill) were still cozied up at Botany Pond, eating and swimming together. I observed a bit of sniping yesterday, as James lunged a bit at Honey when they were both dabbling for corn. But they almost always dine together peacefully. 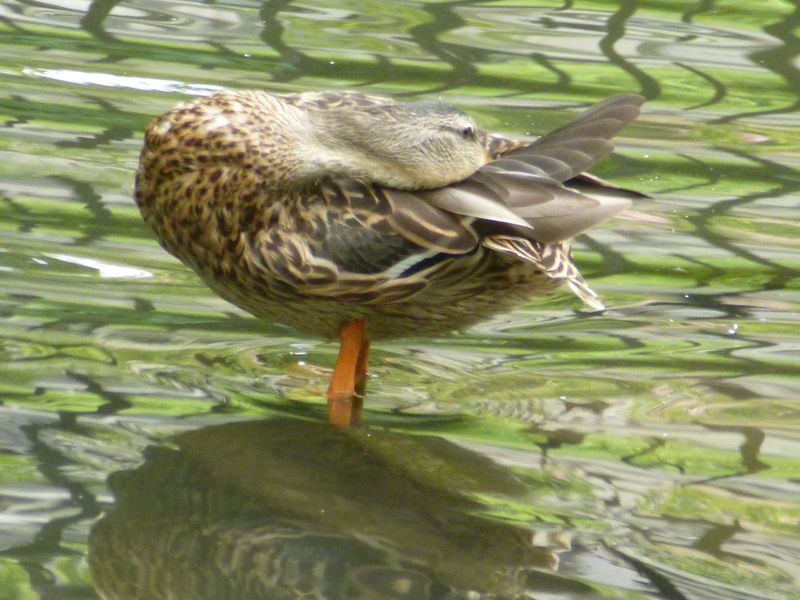 Yesterday was the first anniversary of when Honey left Botany Pond for the winter in 2017, but ducks really aren’t supposed to migrate south until the first freeze or snow, so they may stay around a bit longer this year. (I suspect they go to a staging area before flying in V formation—if they do migrate rather than staying around here.) 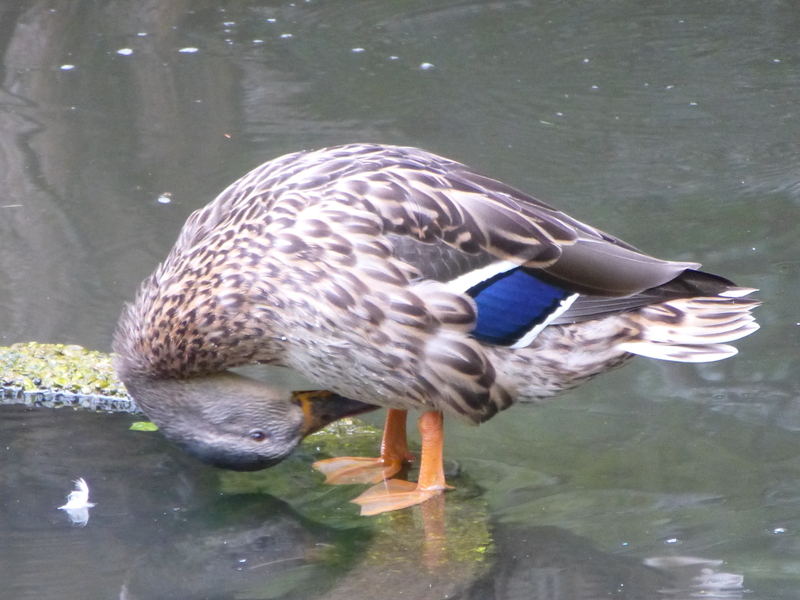 I just went downstairs to give breakfast to Honey and James, and there were no ducks in the pond. 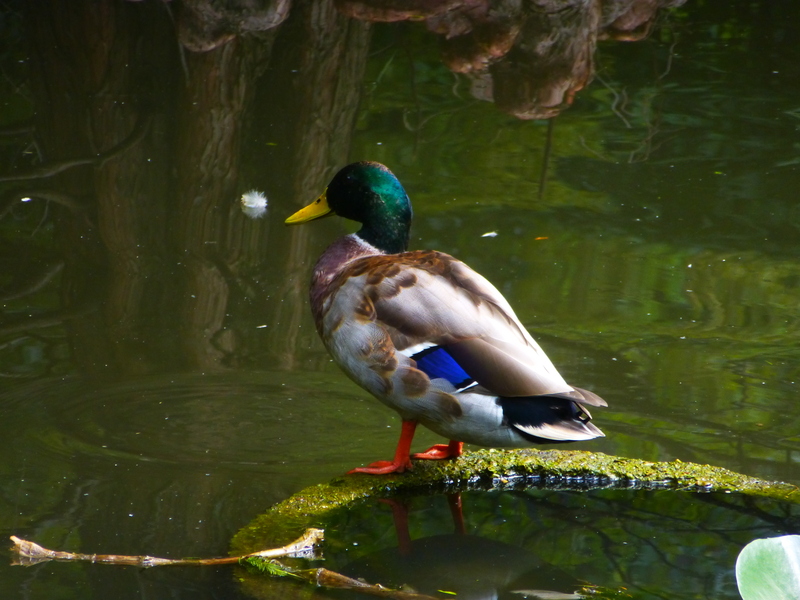 Now both of them tend to leave and then come back after a day, so this may be a temporary hiatus, but it would be interesting if Honey left the pond for good on September 1 two years in a row. I continue to be impressed with the beauty of James. Here are a few shots of him. 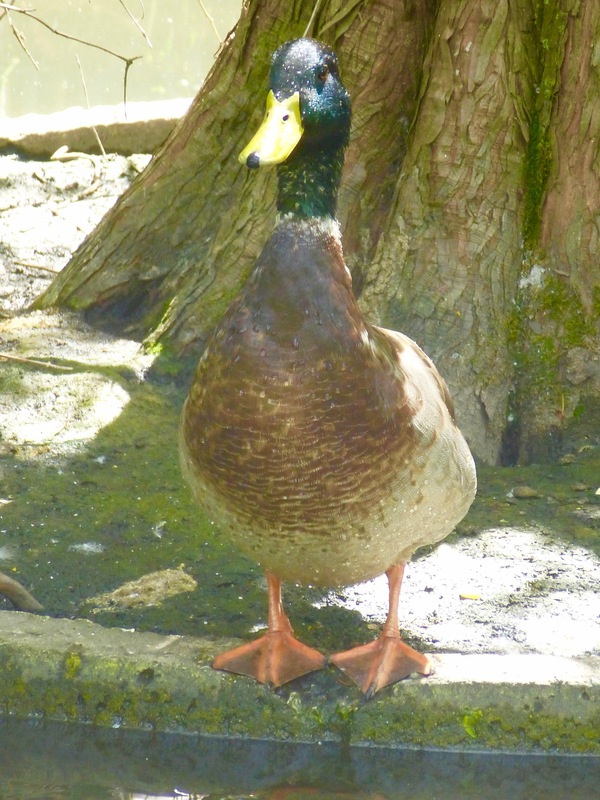 I suspect he’s a hybrid with a domestic duck given his gynormous size, his white coloration (see the flecks on his neck and indistinct white collar), and his gentle demeanor. 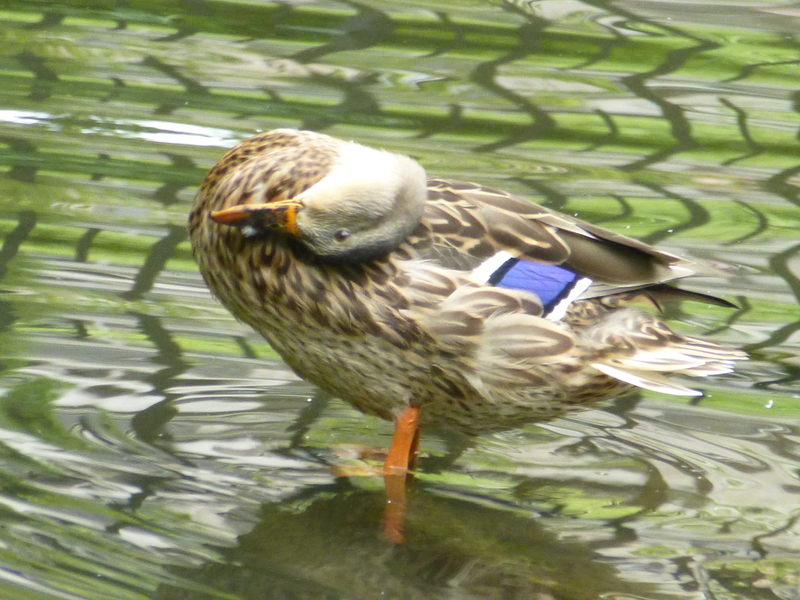 Look how neatly his feathers are arrayed. Here is left wing is folded over his right. A goldfish lurks below. . .
Here’s my video of James grooming himself after lunch yesterday. He’s particularly adept at shaking his tail, an act I find ineffably cute. Honey grooms on a nearby island; note that small flecks (down?) come out of her breast as she’s grooming it. 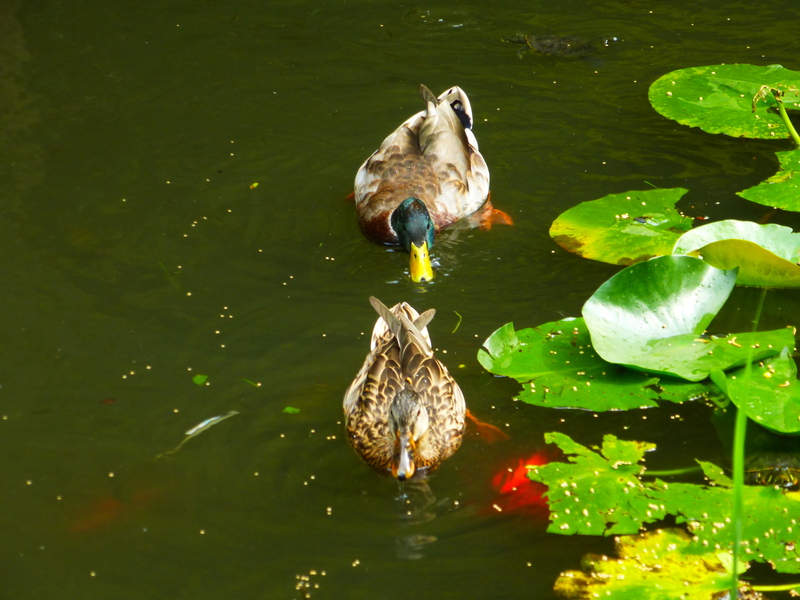 Lunchtime yesterday: the duckling pellet course. I still don’t know what those small yellowish-brown fish are; one reader suggested Gambusia (mosquitofish). Here we see honey’s left wing crossed over her right—the reverse of the past few days. 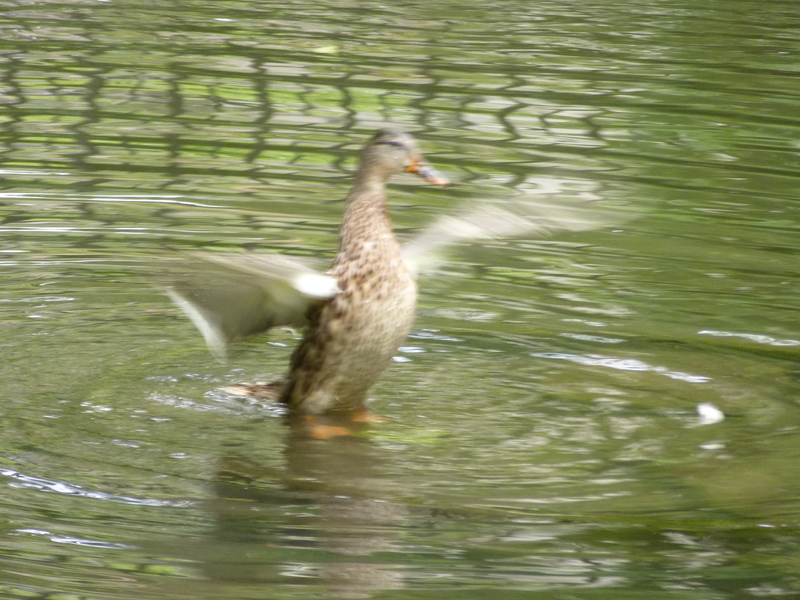 Clearly ducks can fold their wings both ways. My ducks are very clean! This entry was written by whyevolutionistrue and posted on September 2, 2018 at 8:00 am and filed under ducks. Bookmark the permalink. Follow any comments here with the RSS feed for this post. Both comments and trackbacks are currently closed. I observed a bit of sniping yesterday, as James lunged a bit at Honey when they were both dabbling for corn. I do love to hear about Honey and her boyfriends and children. He’s particularly adept at shaking his tail, an act I find ineffably cute. 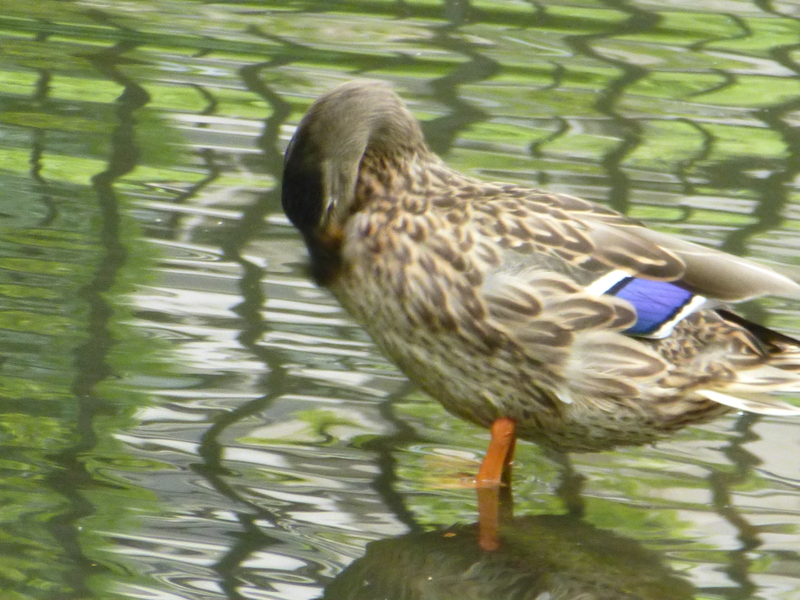 Would the domestic duck that James is hybridised from have been bred for those striking colours? 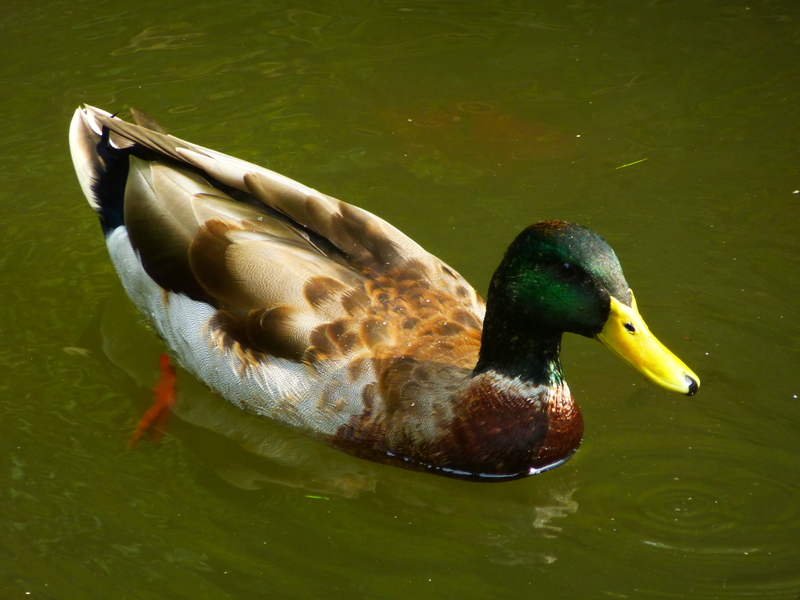 wow, James really is a beautiful duck. Are the small brown fish not young goldfish.? I have goldfish in my pond and each spring there are flocks(? )of small brown fish which mature into the nice orange/gold colour. They could be young goldfish; I simply have no idea. 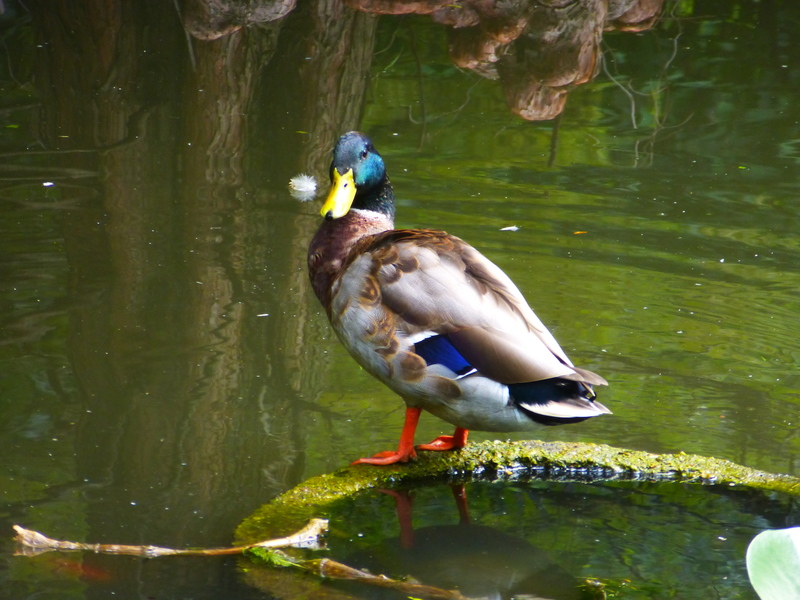 In other news, Honey and James have returned to the pond, though they weren’t very hungry. Missed your post before I commented at #10. I agree. Honey may well be attracted to James’ impressive size and coloration. James may well be attracted to a woman who reliably arranges for a good spread, whether breakfast, lunch or dinner. Is there any way to estimate age with ducks? I’ve been wondering if James Pond is older than Francis Drake. It’ll be interesting to see if James shows up next year with Honey’s next brood, and if he’s kinder to the ducklings than Francis was! yourself away and get some work done?! What a great post! Thanks, PCC(E)! From the video, the little black fishes, particularly the ones with the goldfish underbellies, look like young goldfish. Most of them will turn completely orange as they mature. They may orange up faster depending on their diet too. Koi pellets often contain krill and such, to hasten the brightening of the fish scales. 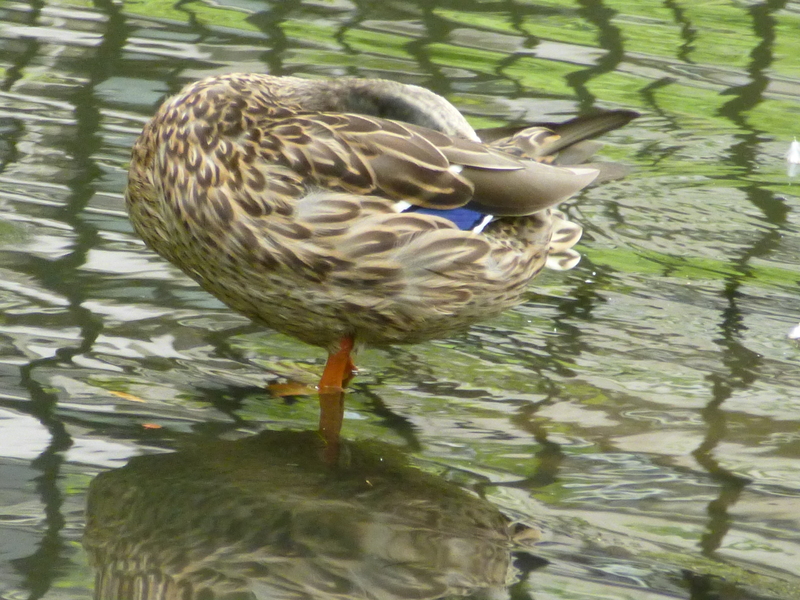 A great duck post! So many pics to enjoy AND videos. I’ll be sad to see them go, and I’ll miss these updates. James is so beautiful, and Honey showed surprising shapes.